I had customer asking if i could make bubble wrap dreads ( she meant as if they were DE dreads that she could braid into her own hair) now i did say no but i suppose i can always go back. 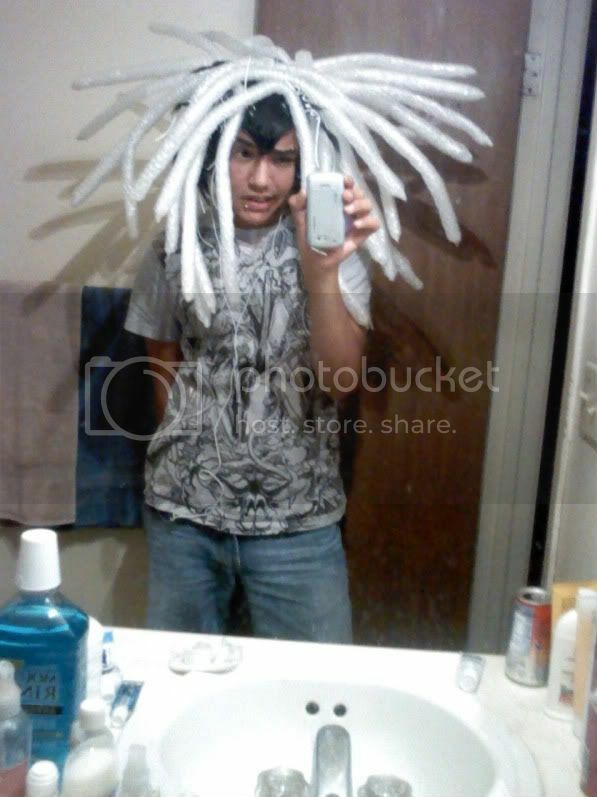 I was wondering if you can, If anyone could find the topic about them on the old forum for me and a word/picture tutorial on how to do bubble wrap dreads. Any help would be super!!!!!! "squidlet squid squidlet squid, squidy squidy squidy"
i tied on a load of bubblewrap into strips then put more around it and secured it and the end when i made mine. i have a photo somewhere i'll try find it. I tried for the LONGEST time to make bubblewrap dreads in the style like Anarchy makes. I tried the method where you cut a strip of bubblewrap, and then wrap it in packaging tape or duct tape, but they would come out STIFF and un-bendable. I tried boiling them to soften them up, but that didn't do anything. I also researched trying to make rolls of bubblewrap, then putting them in heatshrink tubing, but I think those would come out very stiff also! I ended up just purchasing a bubblewrap wig from Anarchy. I'll check out how they are made when the wig gets here! neon love will always be in my heart! ooo id love to see one of those! i have only ever seen pics of them from a distance. I bet you could use this stuff called "stretch wrap" to make very nice, flexible, colorful, non-sticky bubble dreads. "Stretch wrap" is a thin plastic film which only sticks to itself, not to skin, hair, etc. It comes in several colors and it is generally an awesome substance. I've never had any 'fresh' but I've cut through it many times on packaging. Here it is: http://www.uline.com/BL_5400/Uline-Mini-Wrap You can't actually order from Uline, but it's a start. I would love to try making some, though i too have pondered how it was made Though the shrink wrap looks good. "stretch wrap" is better than shrink wrap because it's thinner and doesn't need heat applied to it. VixenSingsBlack wrote: I bet you could use this stuff called "stretch wrap" to make very nice, flexible, colorful, non-sticky bubble dreads. "Stretch wrap" is a thin plastic film which only sticks to itself, not to skin, hair, etc. It comes in several colors and it is generally an awesome substance. I've never had any 'fresh' but I've cut through it many times on packaging. Here it is: http://www.uline.com/BL_5400/Uline-Mini-Wrap You can't actually order from Uline, but it's a start. it's not hard to get a hold of, i have a roll in green! Oh my gosh, I know this post is a little old... but how did you do that?